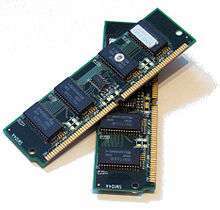 Dynamic random-access memory (DRAM) is a type of random-access memory that stores each bit of data in a separate capacitor within an integrated circuit. The capacitor can be either charged or discharged; these two states are taken to represent the two values of a bit, conventionally called 0 and 1. Since even "nonconducting" transistors always leak a small amount, the capacitors will slowly discharge, and the information eventually fades unless the capacitor charge is refreshed periodically. Because of this refresh requirement, it is a dynamic memory as opposed to static random-access memory (SRAM) and other static types of memory. Unlike flash memory, DRAM is volatile memory (vs. non-volatile memory), since it loses its data quickly when power is removed. However, DRAM does exhibit limited data remanence. DRAM is widely used in digital electronics where low-cost and high-capacity memory is required. One of the largest applications for DRAM is the main memory (colloquially called the "RAM") in modern computers; and as the main memories of components used in these computers such as graphics cards (where the "main memory" is called the graphics memory). In contrast, SRAM, which is faster and more expensive than DRAM, is typically used where speed is of greater concern than cost, such as the cache memories in processors. The advantage of DRAM is its structural simplicity: only one transistor and a capacitor are required per bit, compared to four or six transistors in SRAM. This allows DRAM to reach very high densities. The transistors and capacitors used are extremely small; billions can fit on a single memory chip. Due to the dynamic nature of its memory cells, DRAM consumes relatively large amounts of power, with different ways for managing the power consumption. The Toshiba "Toscal" BC-1411 electronic calculator, which was introduced in November 1966, used a form of DRAM built from discrete components. In 1969 Honeywell asked Intel to make a DRAM using a three-transistor cell that they had developed. This became the Intel 1102 in early 1970. However, the 1102 had many problems, prompting Intel to begin work on their own improved design, in secrecy to avoid conflict with Honeywell. This became the first commercially available DRAM, the Intel 1103, in October 1970, despite initial problems with low yield until the fifth revision of the masks. The 1103 was designed by Joel Karp and laid out by Pat Earhart. The masks were cut by Barbara Maness and Judy Garcia. The first DRAM with multiplexed row and column address lines was the Mostek MK4096 4 Kbit DRAM designed by Robert Proebsting and introduced in 1973. 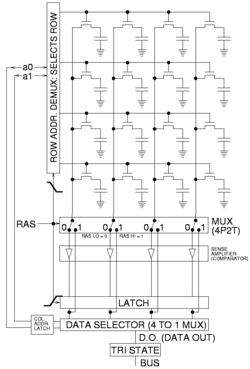 This addressing scheme uses the same address pins to receive the low half and the high half of the address of the memory cell being referenced, switching between the two halves on alternating bus cycles. This was a radical advance, effectively halving the number of address lines required, which enabled it to fit into packages with fewer pins, a cost advantage that grew with every jump in memory size. The MK4096 proved to be a very robust design for customer applications. At the 16 Kbit density, the cost advantage increased; the 16 Kbit Mostek MK4116 DRAM, introduced in 1976, achieved greater than 75% worldwide DRAM market share. However, as density increased to 64 Kbit in the early 1980s, Mostek and other US manufacturers was overtaken by Japanese DRAM manufacturers selling higher-quality DRAMs using the same multiplexing scheme. ...Minimum random access time has improved from tRAC = 50 ns to tRCD + tCL = 22.5 ns, and even the premium 20 ns variety is only 2.5 times better compared to the typical case (~2.22 times better). CAS latency has improved even less, from tCAC = 13 ns to 10 ns. However, the DDR3 memory does achieve 32 times higher bandwidth; due to internal pipelining and wide data paths, it can output two words every 1.25 ns (1600 Mword/s), while the EDO DRAM can output one word per tPC = 20 ns (50 Mword/s). The capacitor has two terminals, one of which is connected to its access transistor, and the other to either ground or VCC/2. In modern DRAMs, the latter case is more common, since it allows faster operation. In modern DRAMs, a voltage of +VCC/2 across the capacitor is required to store a logic one; and a voltage of -VCC/2 across the capacitor is required to store a logic zero. The electrical charge stored in the capacitor is measured in coulombs. For a logic one, the charge is: , where Q is the charge in coulombs and C is the capacitance in farads. A logic zero has a charge of: . The trench capacitor is constructed by etching a deep hole into the silicon substrate. The substrate volume surrounding the hole is then heavily doped to produce a buried n+ plate and to reduce resistance. A layer of oxide-nitride-oxide dielectric is grown or deposited, and finally the hole is filled by depositing doped polysilicon, which forms the top plate of the capacitor. The top the capacitor is connected to the access transistor's drain terminal via a polysilicon strap (Kenner, pp. 42&ndash44). A trench capacitor's depth-to-width ratio in DRAMs of the mid-2000s can exceed 50:1 (Jacob, p. 357). First-generation DRAM ICs (those with capacities of 1 Kbit), of which the first was the Intel 1103, used a three-transistor, one-capacitor (3T1C) DRAM cell. By the second-generation, the requirement to increase density by fitting more bits in a given area, or the requirement to reduce cost by fitting the same amount of bits in a smaller area, lead to the almost universal adaptation of the 1T1C DRAM cell, although a couple of devices with 4 and 16 Kbit capacities continued to use the 3T1C cell for performance reasons (Kenner, p. 6). These performance advantages included, most significantly, the ability to read the state stored by the capacitor without discharging it, avoiding the need to write back what was read out (non-destructive read). A second performance advantage relates to the 3T1C cell has separate transistors for reading and writing; the memory controller can exploit this feature to perform atomic read-modify-writes, where a value is read, modified, and then written back as a single, indivisible operation (Jacob, p. 459). The drive to increase density and performance has led to the one-transistor, zero-capacitor (1T) DRAM cell being a topic of research since the late-1990s. In 1T DRAM cells, there is a transistor for controlling access to a capacitive region used to store the bit of data, but this capacitance is not provided by a separate capacitor. Instead, the parasitic body capacitor inherent in silicon-on-insulator (SOI) transistors is used instead. Subsequently, 1T DRAM cells have the greatest density, and can be easily integrated with logic since they are constructed from the same SOI process technologies used for high-performance logic. A key difference from 1T1C DRAMs is that reads in 1T DRAM are non-destructive; the stored charge causes a detectable shift in the threshold voltage of the transistor. Refresh, however, is still required. Performance-wise, access times are significantly better than capacitor-based DRAMs, but slightly worse than SRAM. Examples of such DRAMs include A-RAM and Z-RAM. 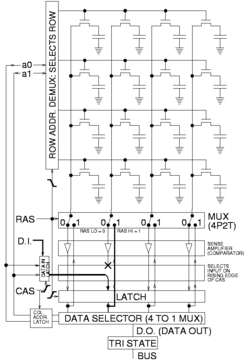 The first DRAM ICs did not have any redundancy. An IC with a defective DRAM cell would be discarded. Beginning with the 64 Kbit generation, DRAM arrays have included spare rows and columns to improve yields. Spare rows and columns provide tolerance of minor fabrication defects which have caused a small number of rows or columns to be inoperable. The defective rows and columns are physically disconnected from the rest of the array by a triggering a programmable fuse or by cutting the wire by a laser. The spare rows or columns are substituted in by remapping logic in the row and column decoders (Jacob, pp. 358–361). DRAM that is integrated into an integrated circuit designed in a logic-optimized process, such as an application-specific integrated circuit (ASIC) or a microprocessor, is called embedded DRAM (eDRAM). Embedded DRAM requires DRAM cell designs that can be fabricated without preventing the fabrication of fast-switching transistors used in high-performance logic, and modification of the basic logic-optimized process technology to accommodate the process steps required to build DRAM cell structures. Electrical or magnetic interference inside a computer system can cause a single bit of DRAM to spontaneously flip to the opposite state. The majority of one-off ("soft") errors in DRAM chips occur as a result of background radiation, chiefly neutrons from cosmic ray secondaries, which may change the contents of one or more memory cells or interfere with the circuitry used to read/write them. Recent studies give widely varying error rates for single event upsets with over seven orders of magnitude difference, ranging from roughly one bit error, per hour, per gigabyte of memory to one bit error, per century, per gigabyte of memory. The problem can be mitigated by using redundant memory bits and additional circuitry that use these bits to detect and correct soft errors. In most cases, the detection and correction logic is performed by the memory controller; sometimes, the required logic is transparently implemented within DRAM chips or modules, enabling the ECC memory functionality for otherwise ECC-incapable systems. The extra memory bits are used to record parity and to enable missing data to be reconstructed by error-correcting code (ECC). Parity allows the detection of all single-bit errors (actually, any odd number of wrong bits). The most common error-correcting code, a SECDED Hamming code, allows a single-bit error to be corrected and, in the usual configuration, with an extra parity bit, double-bit errors to be detected. Although dynamic memory is only specified and guaranteed to retain its contents when supplied with power and refreshed every short period of time (often 64 ms), the memory cell capacitors often retain their values for significantly longer, particularly at low temperatures. Under some conditions most of the data in DRAM can be recovered even if it has not been refreshed for several minutes. Dynamic memory, by definition, requires periodic refresh. Furthermore reading dynamic memory is a destructive operation, requiring a recharge of the storage cells in the row that has been read. If these processes are imperfect, a read operation can cause Soft error. In particular, there is a risk that some charge can leak between nearby cells, causing the refresh or read of one row to cause a disturbance error in an adjacent or even nearby row. The awareness of disturbance errors dates back the first commercially available DRAM in the early 1970s (the Intel 1103). 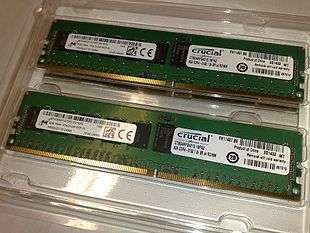 Despite the mitigation techniques employed by manufacturers, commercial researchers proved in a 2014 analysis that commercially available DDR3 DRAM chips manufactured in 2012 and 2013 are susceptible to disturbance errors. The associated side effect that led to observed bit flips has been dubbed row hammer. For economic reasons, the large (main) memories found in personal computers, workstations, and non-handheld game-consoles (such as PlayStation and Xbox) normally consist of dynamic RAM (DRAM). Other parts of the computer, such as cache memories and data buffers in hard disks, normally use static RAM (SRAM). However, since SRAM has high leakage power and low density, die-stacked DRAM has recently been used for designing multi-megabyte sized processor caches. Physically, most DRAM is packaged in black epoxy resin. 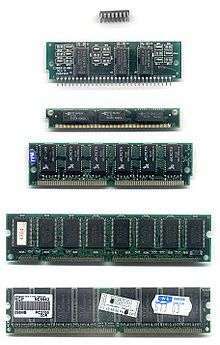 Rambus In-line Memory Module (RIMM), technically DIMMs but called RIMMs due to their proprietary slot. Small outline DIMM (SO-DIMM), about half the size of regular DIMMs, are mostly used in notebooks, small footprint PCs (such as Mini-ITX motherboards), upgradable office printers and networking hardware like routers. Small outline RIMM (SO-RIMM). Smaller version of the RIMM, used in laptops. Technically SO-DIMMs but called SO-RIMMs due to their proprietary slot. Stacked RAM modules contain two or more RAM chips stacked on top of each other. This allows large modules to be manufactured using cheaper low density wafers. Stacked chip modules draw more power, and tend to run hotter than non-stacked modules. Stacked modules can be packaged using the older TSOP or the newer BGA style IC chips. Silicon dies connected with older wire bonding or newer TSV. Several proposed stacked RAM approaches exist, with TSV and much wider interfaces, including Wide I/O, Wide I/O 2, Hybrid Memory Cube and High Bandwidth Memory. The exact number of bytes in a DRAM module is always an integral power of two. A 512 MB (as marked on a module) SDRAM DIMM, actually contains 512 MiB (mebibytes) = 512 × 220 bytes = 229 bytes = 536,870,912 bytes exactly, and might be made of 8 or 9 SDRAM chips, each containing exactly 512 Mib (mebibits) of storage, and each one contributing 8 bits to the DIMM's 64- or 72-​bit width. For comparison, a 2 GB SDRAM module contains 2 GiB (gibibytes) = 2 × 230 bytes = 231 bytes = 2,147,483,648 bytes of memory, exactly. The module usually has 8 SDRAM chips of 256 MiB each. While the fundamental DRAM cell and array has maintained the same basic structure (and performance) for many years, there have been many different interfaces for communicating with DRAM chips. When one speaks about "DRAM types", one is generally referring to the interface that is used. DRAM can be divided into asynchronous and synchronous DRAM. In addition, graphics DRAM is specially designed for graphics tasks, and can be asynchronous or synchronous DRAM in nature. 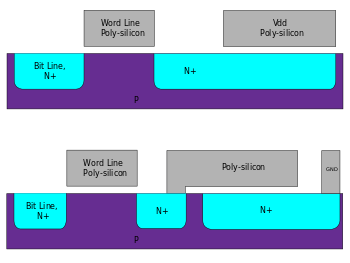 Pseudostatic RAM (PSRAM) have an architecture and interface that closely mimics the operation and interface of static RAM. Lastly, 1T DRAM uses a capacitorless design, as opposed to the usual 1T/1C (one transistor/one capacitor) designs of conventional DRAM. EDO DRAM, sometimes referred to as Hyper Page Mode enabled DRAM, is similar to Fast Page Mode DRAM with the additional feature that a new access cycle can be started while keeping the data output of the previous cycle active. This allows a certain amount of overlap in operation (pipelining), allowing somewhat improved performance. It was 5% faster than FPM DRAM, which it began to replace in 1995, when Intel introduced the 430FX chipset that supported EDO DRAM. Direct RAMBUS DRAM (DRDRAM) was developed by Rambus. These are asynchronous and synchronous DRAMs designed for graphics-related tasks such as texture memory and framebuffers, and can be found on video cards. Graphics double data rate SDRAM (GDDR SDRAM) is a type of specialized DDR SDRAM designed to be used as the main memory of graphics processing units (GPUs). GDDR SDRAM is distinct from commodity types of DDR SDRAM such as DDR3, although they share some core technologies. Their primary characteristics are higher clock frequencies for both the DRAM core and I/O interface, which provides greater memory bandwidth for GPUs. As of 2016, there are five successive generations of GDDR: GDDR2, GDDR3, GDDR4, GDDR5, and GDDR5X. 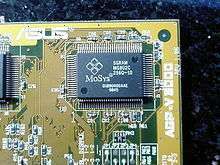 An embedded variant of PSRAM is sold by MoSys under the name 1T-SRAM. It is technically DRAM, but behaves much like SRAM. It is used in Nintendo Gamecube and Wii video game consoles. ↑ "How to "open" microchip and what's inside? : ZeptoBars". 2012-11-15. Retrieved 2016-04-02. Micron MT4C1024 — 1 mebibit (220 bit) dynamic ram. Widely used in 286 and 386-era computers, early 90's. Die size - 8662x3969µm. ↑ S. Mittal, "A Survey of Architectural Techniques For DRAM Power Management", IJHPSA, 4(2), 110-119, 2012. ↑ "Lecture 12: DRAM Basics" (PDF). utah.edu. 2011-02-17. Retrieved 2015-03-10. ↑ David August (2004-11-23). "Lecture 20: Memory Technology" (PDF). cs.princeton.edu. pp. 3–5. Retrieved 2015-03-10. 1 2 3 4 5 6 7 8 9 Kenner pp. 24–30. ↑ Lest We Remember: Cold Boot Attacks on Encryption Keys, Halderman et al, USENIX Security 2008. ↑ Sallese, Jean-Michel (2002-06-20). "Principles of the 1T Dynamic Access Memory Concept on SOI" (PDF). MOS Modeling and Parameter Extraction Group Meeting. Wroclaw, Poland. Retrieved 2007-10-07. 1 2 Schroeder, Bianca et al. (2009). "DRAM errors in the wild: a large-scale field study". Proceedings of the Eleventh International Joint Conference on Measurement and Modeling of Computer Systems, pp. 193–204. ↑ "ECC DRAM – Intelligent Memory". intelligentmemory.com. Retrieved 2015-01-16. ↑ Li, Huang; Shen, Chu (2010). ""A Realistic Evaluation of Memory Hardware Errors and Software System Susceptibility". Usenix Annual Tech Conference 2010" (PDF). ↑ "Cycles, cells and platters: an empirical analysis of hardware failures on a million consumer PCs. Proceedings of the sixth conference on Computer systems (EuroSys '11). pp 343-356" (PDF). 2011. ↑ Scheick, Leif Z.; Guertin, Steven M.; Swift, Gary M. (December 2000). "Analysis of radiation effects on individual DRAM cells". IEEE Trans. on Nuclear Science. 47 (6): 2534–2538. doi:10.1109/23.903804. ISSN 0018-9499. Retrieved 2013-08-08. ↑ Yoongu Kim; Ross Daly; Jeremie Kim; Chris Fallin; Ji Hye Lee; Donghyuk Lee; Chris Wilkerson; Konrad Lai; Onur Mutlu (June 24, 2014). "Flipping Bits in Memory Without Accessing Them: DRAM Disturbance Errors" (PDF). ece.cmu.edu. Retrieved March 10, 2015. Brent Keeth, R. Jacob Baker, Brian Johnson, Feng Lin. (2008). DRAM Circuit Design: Fundamental and High-Speed Topics. John Wiley & Sons.